There are certain words that shouldn’t be used in polite company: one of them is “postprandial”. All it means is after dinner, of course, but it’s such a snooty way to say it. I was once seated next to a woman at a dinner party who, following dessert and coffee, informed me that it was now time for her “postprandial pee”. Considering all the wine she’d had, a trip to the restroom was an inevitability, but a simple “excuse me” would have sufficed. Another word that should be banned from conversation is autodidact. It’s certainly a fancy term, but if I said to you, “When it comes to art, I am an autodidact,” you might smile and nod, but you’d be thinking, “you’re also a jackass.” On the other hand, if I simply admitted to you that I didn’t have a lot of formal art education, that I’m basically self-taught on that subject, you still might think I’m a jackass, but at least not an arrogant one. It’s true that I only had a couple of art classes in school, so most of what I know about art I did learn on my own. I’m no expert (as you can tell if you’ve been following this blog), but it seems to me there’s no substitute for standing face-to-face with the original artworks. There are, however, hundreds of thousands of books on the subject as well, of which I’ve read, oh, maybe fifty or so. Some are tedious — the print version of Ambien — but others don’t seem like homework at all. In fact, several of them compare favorably with best-selling novels for making you want to keep turning pages. Michelangelo and the Pope’s Ceiling Michelangelo was an artist of great renown when he took on the task of painting the ceiling of the Sistine Chapel in the Vatican. Part of the challenge was that he had almost no prior experience with fresco (pigment mixed into wet plaster). With a little help, he taught himself how to do it. This book delves into the political and cultural dramas that swirled around Michelangelo while he spent over a decade creating a masterpiece. The Judgment of Paris My favorite book by King, it’s about Edouard Manet and his late-19th century colleagues who ushered in the era of Impressionism. It reveals the personality quirks of these artists who were experimenting with new techniques, and charts the ascendancy of these “outcasts” in the art world. 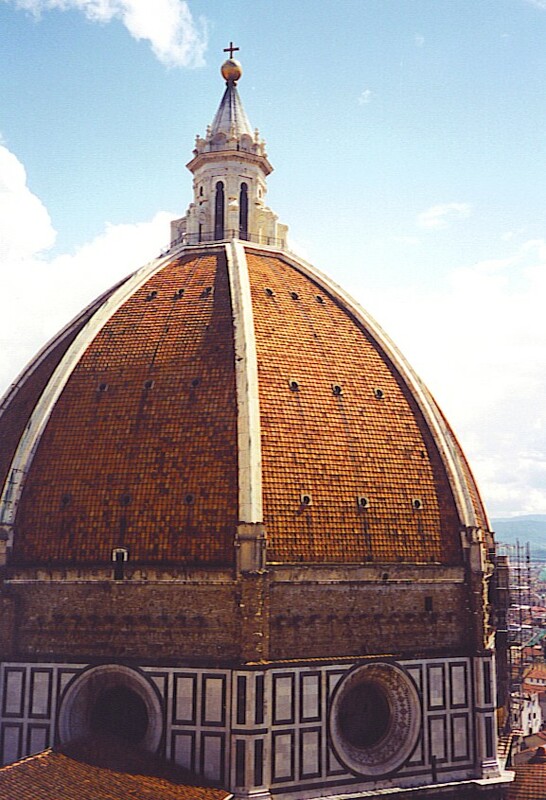 Brunelleschi’s Dome A Renaissance goldsmith in Florence, Filippo Brunelleschi was commissioned to build a dome for the local cathedral. Domes had been fairly common a thousand years before, but in the intervening centuries, humans forgot how to build them. I don’t think it’s giving away the ending to tell you that Brunelleschi essentially reinvented architecture. And I’ll bet he had too much class to refer to himself as an autodidact. This entry was posted in Art and tagged Ross King. Bookmark the permalink. All good information. Thanks for the tips. But I’d like to use this comment space to suggest another word that I’d like to see banned. That word would be “awesome.” And not because people who overuse it seem snooty. They seem dim. Either that or they’re simply too easily amazed. Earlier this evening I ordered a cup of coffee after my meal. The waiter’s reply? “Awesome.” Really? That made his day? Oh, well. Perhaps I’m just an old fogey and “awesome” is the “in” postprandial thing to say. I’m with you, Dave. “Awesome” is far too overused (though I’m sure it’s still the first thing that pops into my head as the Taco Bell hits my taste buds). My work buddy and I were just noticing how “amazing” has become so common, too, and that if we’re gonna exaggerate run-of-the-mill occurrences, why not be a little more creative? I’m trying to incorporate “spellbinding” into small talk wherever possible. That’s been going over big when I’m watching ballgames with the guys. On an unrelated note, I’d just like to say that, pre-Lucas, posting thoughts on my dad’s blog at 3am might be something I would’ve thought twice about doing. But since people assume that I’m steaming a bottle of milk at this hour, I feel a new sense of social freedom. It’s aweso…it’s nice. Good article, Dad. Sounds like I should borrow The Judgment of Paris. I’d noticed that tendency toward extravagant overstatement, too, and was considering doing a blog post about it. I was going to call it “The Greatest Hyperbole in the Galaxy!! !” You guys are way ahead of me, though. Thanks for the comments. Your word ban might well include “idiosyncratic.” I knew an otherwise decent chap who liked to wheel that one out now and then. A scholarly type (and don’t you forget it), he evidently needed to remind us of his erudition, especially in the presence of Ph.D.s, who tend to swarm in our eight-college town. Haven’t read Reeder lately, enjoyed this. I suppose awesome wouldn’t be an appropriate description of the article? Exactly the sort of read I was looking for. Since the “women who come and go speak of Michaelangelo” I’ll start with that one. I think you’ll like it, Monty. And J. Alfred Prufrock might have loved it. Can back Tom up on the Michaelangelo book, it is terrific. Charles Nicholl’s ‘Leonardo da Vinci: The Flights of the Mind’ is also well worth a read. Thanks for the tip on the book about Leonardo, David. I hadn’t heard of it (which doesn’t prove a thing), but now I intend to track it down. I like autodidact, it is an interesting word. Obviously, if you use any word that has more than three syllable in a snooty, know-it-all way and of course, if you use it casually and in an ignorant, misinformed way, it will appear arrogant and conceited. I first encountered the word autodidact when David Hare used it on Nicole Kidman — “SIR DAVID HARE: You know, Kidman, she’s an autodidact. She’s somebody, you put in front of her and she will learn how to do it. She likes nothing more than a practical task and she has a flair for self-improvement which is greater than any actor I’ve ever known”. He is obviously highlighting the practical and no-nonsense implications of the word. And isn’t it a form of inverse snobbery to think that certain words should be used only by certain people and in certain contexts? My view is just that there are some words that are fine in print, but seem out of place in conversation. Another example would be “pusillanimous”, which is somehow acceptable in a novel, but if talking to friends, I’d go with “timid” or “cowardly” instead. When writing a TV script, we tried to avoid words like that; the criticism was that speeches containing them “sounded written.” The exceptions were characters like Major Winchester on M*A*S*H, or Frasier Crane. They were supposed to sound pedantic — as you said, “snooty know-it-all”.